Do you ever feel like a used car salesman when asking for a sale? 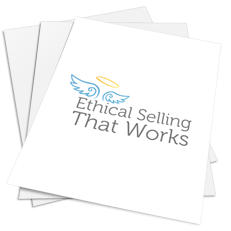 Ever wondered if ethical selling is just a notion people invented to help them sleep better at night? Pamela Slim has created a program to show you that selling your services can feel as clean, clear, and natural as the way you deliver them. Stop feeling scared to ask someone to buy from you and instead feel confidence that you’re giving your customers WAY more than they expect. We all want to sell our services. Okay, we NEED to sell our services. But so often it can feel deceitful, slimy, or wrong to ask people to give you money and no one ever addresses that issue! This program, however, shows you how to give out your best work, increase the flow of top-paying customers coming your way, and flips your thinking to make asking for the sale feel amazingly good. This course approaches all aspects of selling. You’ll learn how to craft stellar proposals, write ‘cold calls’ that get you a ‘yes’, and how to follow up with clients in a way that doesn’t make you sound desperate. You’ll also never have to say, “I’m just checking in to see if you’re ready to move forward,” or, “Yes, I can offer you a discount,” again thanks to the tactics Pamela gives you in the modules. Pamela admits she’s a big fan of instant gratification so her program is all about shortcuts and fast results when it comes to landing new clients and bringing in more money for your business. Consider this your high-powered business fitness training program, so your sales process feels as joyful and meaningful as your work with clients. Learn how to work your sales process and create a system of natural follow-ups that ensure repeat sales and little effort. Pamela’s Ethical Selling That Works course is a must have for all service providers who want to take their businesses seriously.